It's easy to find music with SEMSIX. No need to register. No need to log in. Saves time. 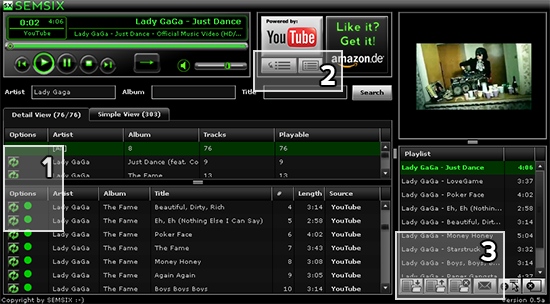 SEMSIX searches several major music portals at the same time. Checks the quality of videos and lists the best quality videos first in search results. Create your own playlists and listen to them as often you want. Search lyrics and sing along. Search for and listen to web radio stations by genre, artist or city. Unforunately we had to disable SEMSIX due to the lack of legaly alvailable music videos on the connected video platforms. The quality of videos are shown with colored dots - green standing for the best quality. Click to search better quality videos for a specific song, or all the songs on an album. If you don't like the video playing, click to choose a different video for the same song. Simply drag songs into the playlist, or add a whole album by double-clicking on it. Save your playlists and listen to them. Or send them to your friends.